International Women’s Day in Russia was first marked on March 8, 1913, when women demanded the right to vote via a public demonstration. It became a recognized public holiday in Russia in 1918, and it is the current analog of “Men’s Day” celebrated on February 23rd. In fact, in Russia, this holiday is not called “Women’s Day”. It’s such a big public holiday that it’s just referred to as “the 8th of March”. On this day, Russian men and women bring gifts and flowers to all the important women in their lives and tell them “C vos’mym Marta!” (Happy March 8th!). March 8th, or Women’s Day, is roughly comparable to Mother’s Day in the rest of the world, except that it celebrates all women – mothers, sisters, teachers, grandmothers, and so on. Mother’s Day is not celebrated in Russia, so March 8th functions as a celebration of both mothers and women in general. Women’s achievements in the personal, public and political spheres are acknowledged and celebrated. Women’s Day in Russia is as important, if not more important, than Mother’s Day elsewhere – it is even a recognized public holiday, so many workers get the day off. Russia is still quite a patriarchal country, so women’s day remains an important public holiday (regardless of one’s feminist leanings). It’s an empowering event, even though the intensity and style with which it is celebrated may sometimes seem patronizing to women from more egalitarian societies. 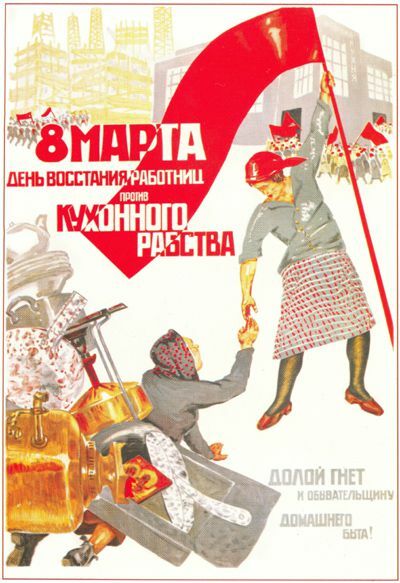 Despite any feminist issues with the holiday, March 8th is deeply ingrained in Russian history and culture. Even Russian women living abroad (in the aforementioned egalitarian, more feminist societies) have a bit of a soft spot for the holiday, and love when it is celebrated by their friends and partners – although often they won’t let on in advance (partners of Russian women, take note!). Women’s Day in Russia is celebrated like a combination of Mother’s Day and Valentine’s Day elsewhere in the world. Men and women celebrate important women in their lives by giving them flowers and gifts. Common flowers are spring varieties such as tulips, mimosas, and daffodils. Chocolates are also a hugely popular gift. In the evening, some couples go out for a nice dinner; however it is also common for March 8th to be celebrated in a family circle with a home-made meal and cake. Most women give and receive some token of affection on this day. Women celebrate their friends, mothers, sisters and grandmothers just as men. Even something as small as an e-mail, Facebook post or a card is appreciated (and often even expected) among friends and family. More expensive or complex gifts are exchanged between people who have a close relationship, such as mother and child or partners. Perfume and jewelry are common gifts. Many men also take over the housework on this day as a token of their appreciation (as mentioned, Russia is quite patriarchal and traditional home roles are still often upheld). Since most people have the day off work on March 8th, many companies organize a corporate celebration of Women’s Day the day before or after the holiday. Women receive bouquets of flowers and sometimes chocolate or personalized gifts. Cake and champagne are usually served as well. At school, children bring their (female) teachers flowers. The younger grades make Women’s Day-themed arts and crafts projects - such as origami flowers, bracelets and greeting cards - to bring home to their mothers and grandmothers.